We came across a refreshing story on reddit about a day in a the life of a Filipino. It shows living the life of simplicity, being content with what we have, and being able to get by. We feel many of us can relate to it and we’d like to share it with you. Being inspired by a user from Finland, I’ve decided that I would share a little bit about living a mundane life in the Philippines. A little bit about myself, I’m a 32-year-old lower middle (debatable) class man living in Quezon City, Manila, The Philippines. Manila is the most densely populated city in the world. A crowded fairground has nothing on the streets of Manila. If you’re not into people packed places, you’ll definitely feel uncomfortable here yet it is home for me. Weather in the Philippines is pretty much a question of ‘how hot is it today?’ Since we’re now fairly into the monsoon season, temperature ranges from 30C in the morning to about 26C at night. I normally wake up due to the heat rather than anything else. I can’t really afford an air conditioning unit because electricity is very expensive. I use an electric fan to circulate the air in the room. It does an awesome job at that and I’m happy with it. I normally don’t linger too much in bed since I have a few things to do before going to work. This is my dog Lupe. She is a six-year-old mongrel my mom got for me as a Christmas gift in 2010. My mom was out buying food in one of the biggest open-air markets in the city when she saw an old lady pushing an old, rusty, shopping cart filled with puppies. The lady then proceeded to lay the puppies down on the curb to display them as items for sale. My mom decided took a gander and decided that I needed a dog, hence Lupe. When she got Lupe she was in a sorry state. 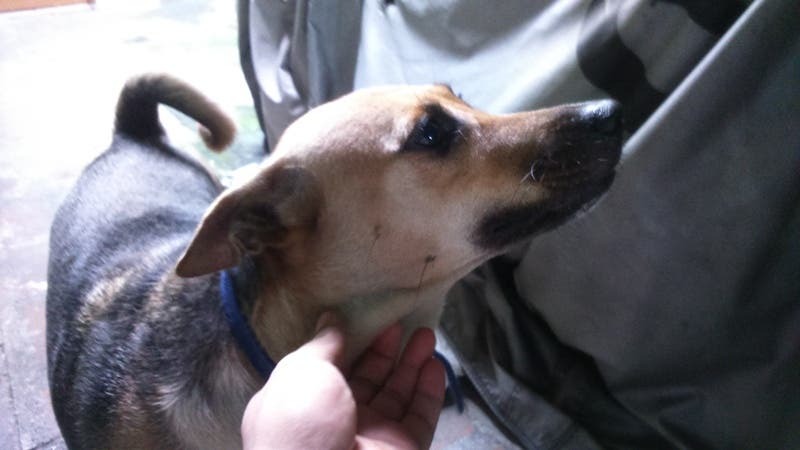 The lady drugged the puppies to make them compliant and less likely to run away. It took a couple of days but we got her healthy pretty quick. I generally work out every other day before breakfast. It helps me control my weight since I love to cook and eat. This is one of my favorite dishes. 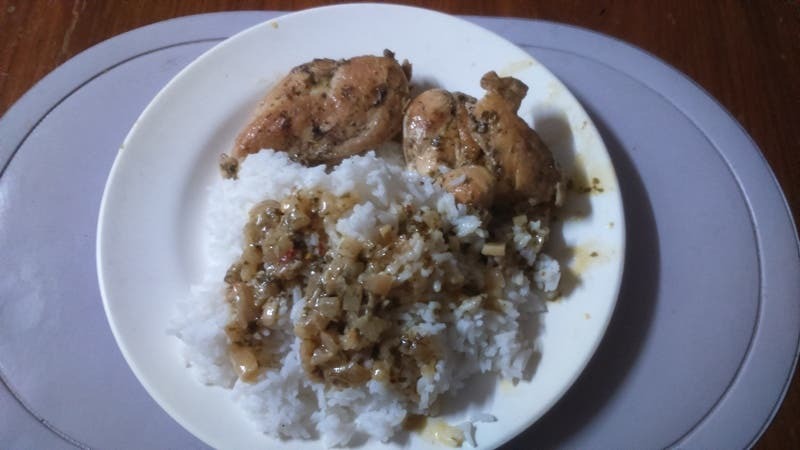 Chicken cooked in coconut onion sauce. It probably has a proper name but for the life of me, I can’t remember it. One thing of note that I have noticed about people trying Filipino food for the first time. Most people don’t seem to know that Filipino dishes are mostly designed to be eaten with rice. A lot of our dishes are very savory so it would be too much to eat those without rice. After doing my morning ablutions and saying goodbye to Lupe, I leave the house to face the dread of every motorist everywhere, traffic congestion. 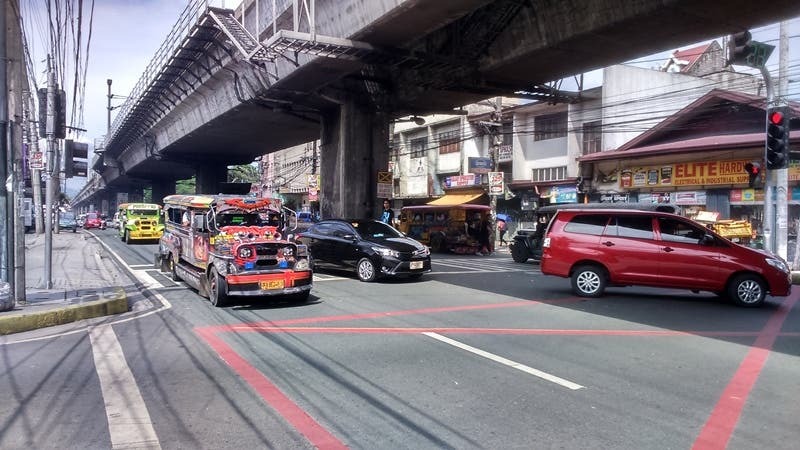 This is a picture of Aurora Boulevard, one of the busiest streets in Quezon city. As you can see, most people don’t give one bit about street rules. 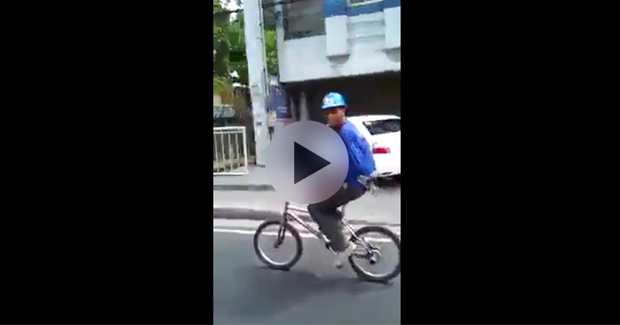 If they don’t see any traffic enforcers, then be more than aware of your surroundings. Getting swiped is a real thing here. The tricycle is the most common form of public transportation available for those on the commute. It’s cheap, relatively fast, and totally unsafe. It’s not allowed on highways or on any heavy traffic streets. They ply their routes around the smaller side streets and congressional avenues. It is also my first ride out of my place. It takes me about five minutes to get to my stop. The Tricycle carries up to five full grown people at full load. The cab can carry three inside then two people ride side saddle behind the driver. You’d know pretty quick if you’re putting on the pounds because it is fitted for the average Filipino size. The Jeepney has a long history and has a special place in the heart of each and every Filipino. It was conceived after WWII when the American forces left the country leaving their jeeps behind. Somebody had a great idea about extending the back and “oversizing” the chassis but keeping the original design. It can carry up to 22 passengers at max load. It’s pretty cheap too at $0.17 for the initial 4 km. After my first stop, I have to catch two of these to get to my office. It takes me about 1 hour and 10 minutes to get to work all in all. We have a love and hate relationship with the Jeepney. We like them because they’re very interesting. There is no regulation design or color like most public transportation in the world because here, public transportation is privately-owned but government-controlled. We also love them for the fact that you can hitch a ride almost anywhere and get to your destination pretty quickly. We hate them because most of the jeepneys are very old (about 12+ years old) with second-hand Japanese diesel engines. They’re loud and produces a lot of pollution. I work as a language facilitator for a French company so I work French hours. I start at 2:00 pm up until 11:30 pm. I’ve been working the same schedule for the last ten years and is pretty used to it. I’m pretty happy with what I do. I know it’s not glamorous but hey, it’s a living and I’m content with it. It’s about 2:30 in the morning and I’m feeling a little peckish after taking Lupe out for a half an hour walk. Instant noodles have a pretty strange reputation here. It was once billed as the answer to poverty. for about $0.17 you can have a pack of these and if you have some cooked rice, it could feed a couple of people. It’s not healthy but if you’re at the point where it either you eat or you don’t, proper eating is the least of your problems. I just love it for the taste. I try not to over do it and keep my consumption at a reasonable level. 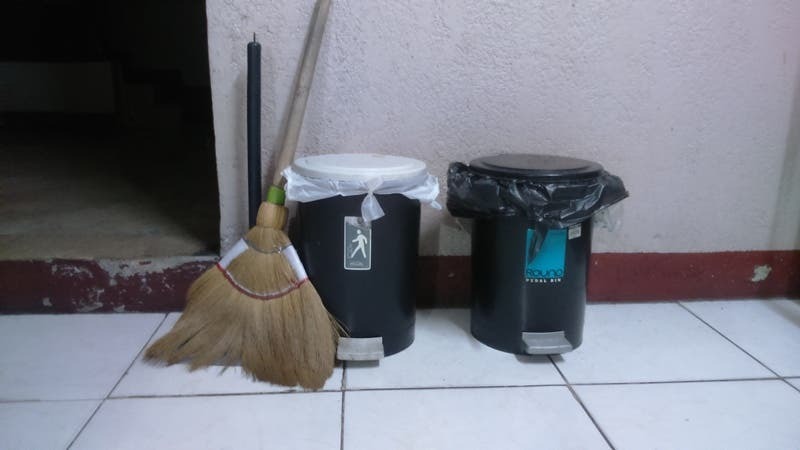 That, my friend, is called a ‘Walis-tambo’ every Filipino child has experienced getting whacked by one of these at least once. Walis-tambo’ is a soft broom, usually made of the Phragmites grass. It is designed for indoor use and it’s very effective. I generally do a sweep before sleeping because I’m not a big fan of dust and dirt. Yes, I have two trashcans. One biodegradable and one for not. Doing my part even for a little bit. That light shines directly at the window but I’ve gotten used to it so I’m not really concerned. I don’t normally have a curtain because it just makes the room hotter in the day so there are some people out there that have seen me buck naked when changing. My bedroom is on the second floor of the house so I’m not flashing people (That would be hilarious though). It’s now 5:00 am and I’m feeling tired. I normally sleep around that time so that I can wake up at around 11:00 am to get ready for work. I hope you guys enjoyed this and if you guys want more, let me know! Do you have a similar story to tell? Share it with us! VIDEO: Overwatch’s Animated Short is Totally Epic!